We review the original descriptions of 5 eponymous signs (n=6) associated with non-traumatic abdominal ecchymosis. These commonly cited eponyms involving the abdominal wall and flanks (Grey Turner, Cullen and Stabler); scrotum (Bryant) and upper thigh (Fox) may be useful clues directing the examiner to consider potentially serious causes of abdominal pathology. Cullen originally described the finding at the 43rd annual meeting of the Transactions of the American gyecological society, Pennsylvania May 16-18 1918 [Am J Obstet Gynecol 1918;78:457]. Despite the original description, most literature relates Cullen sign of periumbilical ecchymosis to acute pancreatitis (being recorded in 1-3% cases) rather than secondary to an ectopic pregnancy. 54 year old female with three days of abdominal pain presenting with an area of discoloration (a bluish colour), about 6 inches in diameter involving the abdominal wall surrounding the umbilicus (see Cullen sign…). The tenderness over the gall-bladder region was very marked, and I now noticed two large discoloured areas in the loins. 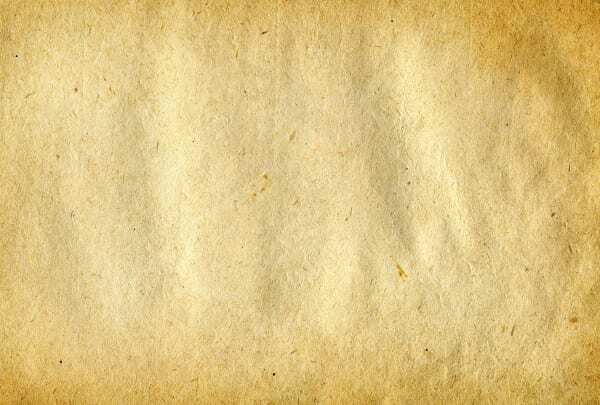 They were about the size of the palm of the hand, slightly raised above the surface, and of a dirty-greenish colour. CT scanning has helped to define the anatomic pathway by which extravasated pancreatic enzymes and their effects lead to these cutaneous discolorations. [Pancreas. 1998 May;16(4):551-5.]. Extraperitoneal diffusion from the anterior pararenal space between the two leaves of the posterior renal fascia; to the lateral edge of the quadratus lumborum muscle and may then extend to the posterior pararenal space and the structures of the flank wall. The lumbar triangle, a site of anatomic weakness on the flank wall, provides an external window into the internal proteolytic events. 1966 – JA Fox (London) detailed 2 fatal cases of non-traumatic ecchymosis determined as a diagnostic sign of retroperitoneal haemorrhage. In both cases, this sign was noticed late in the course and produced by tracking of the fluid extraperitoneally along the fascia of psoas and iliacus beneath the inguinal ligament until it became subcutaneous in the upper thigh. “..seems likely that the clinical sign seen in the above 2 cases is produced by tracking of the fluid extraperitoneally along the fascia of psoas and iliacus beneath the inguinal ligament until it becomes subcutaneous in the upper thigh. Subsequently described with strangulated ileum, urethral instrumentation, reaction to subcutaneous injections, and pulmonary infarction. Blood must transverse the inguinal canal and spermatic cord down to the subcutaneous scrotal tissue. It requires specific pathological circumstances such as a closed (retroperitoneal hematoma) or sealed (surrounding retroperitoneal and aortic tissue) rupture of abdominal aortic aneurysm. It requires a slow rate of aneurysmal leakage and a prolonged interval prior to final rupture. 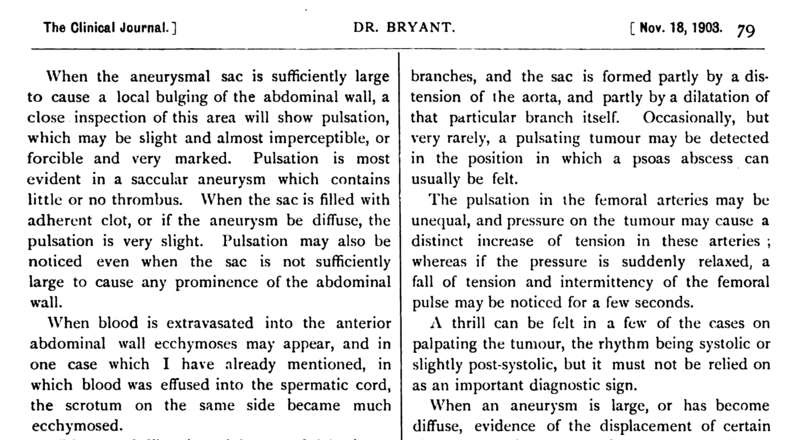 Most recorded cases of Bryant sign occur three to six days after onset of abdominal symptoms – Pearlman (1940), Barratt-Boyes (1957) and Beebe (1958). The original publications of the eponymised cases often include careful clinical descriptions and anatomopathophysiological hypotheses in an era devoid of adjunctive diagnostic aids. However, we now have the benefit of comparing the diagnostic validity of the signs in a vast array of published clinical cases illuminated by enhanced imaging techniques and a more in-depth understanding of pathophysiology. The original n=1 published cases represent a springboard for us to review arcane terminology by first understanding the historical folksonomy and then to redefine in clinical context to reduce descriptive confusion and narrowing of our diagnostic differentials. 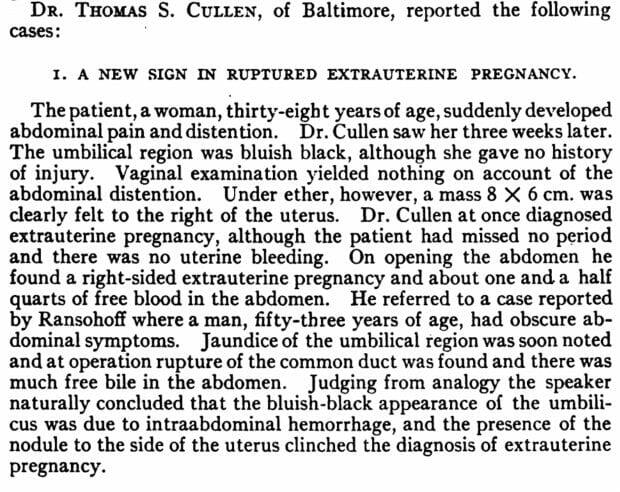 For example, in 1918 Cullen described a single case of umbilical ecchymoses in a patient with an ectopic pregnancy. 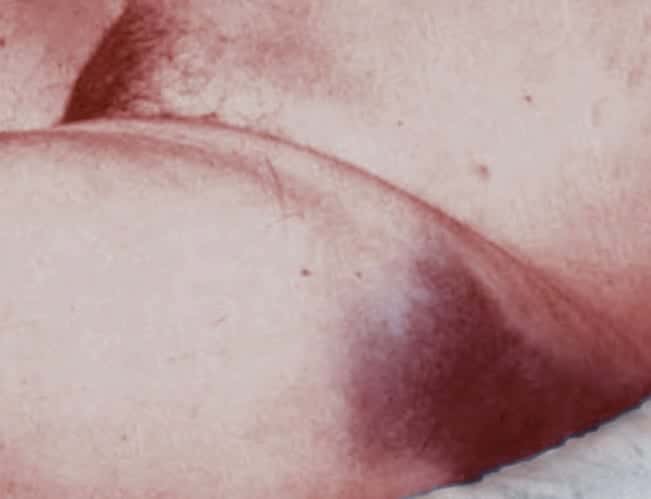 Over the subsequent 100 years at least 17 alternate diagnoses have been ascribed to the external abdominal manifestation of his eponymous sign. Of significant note, the topographic location of atraumatic abdominal ecchymosis does not point to the aetiology with any degree of certainty and these signs may be potentiated by anticoagulation therapy or qualitative/quantitative platelet abnormalities.